The news we heard on Tuesday, January 11, 2013 that the Pope has chosen to resign raises the question – What’s next? Of course, the Cardinals will be gathering soon in Rome to carefully discern who is being called to serve our church in this leadership position. For our children, this is a wonderful time to talk about leadership in our church. And in this blog post I will suggest a variety of ways to engage our Digital Natives to learn more about the process of electing our next Pope and to get to know more about him after his election. 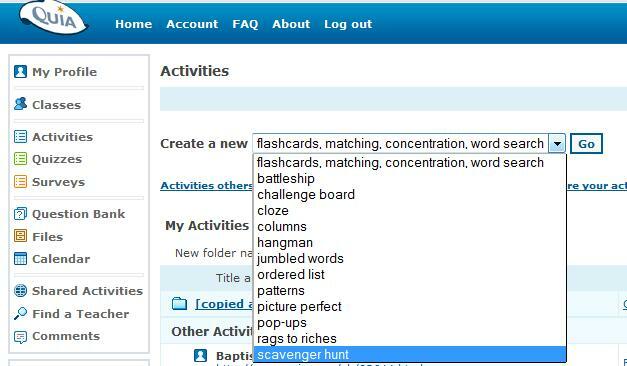 Host an online Scavenger Hunt: Sign-up for a 30-day free trial at Quia so that you will have access to the Scavenger Hunt Activity. Who are our US Cardinals? Pope Benedict has resigned – What Happens Next? Will the cardinals elect a Black Pope? Who Runs the Vatican After the Pope Steps Down? Video: How Do They Choose the Pope? 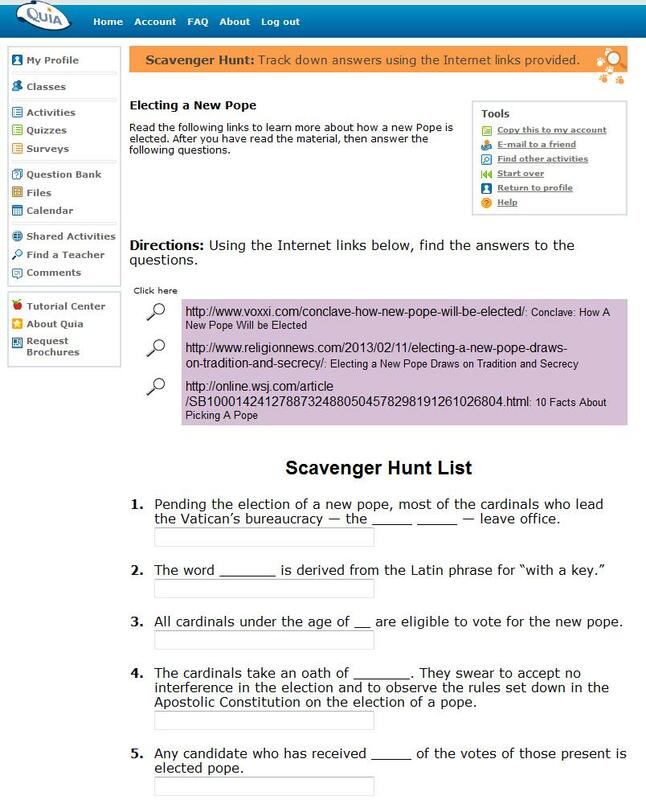 Here is an example of an online Scavenger Hunt created with the Quia Tool. Create a WORDLE of qualities that are important for our next pope to have. Break out your class into small groups of 3 or 4 students. Direct them to read the article – Which Qualities Cardinals Will Look For in the Next Pope . Invite them to list the qualities and to include qualities that they feel are important for the next Pope to have. Once they have their list completed. Send them to WORDLE to create a Word Cloud of these qualities. Create a 30-second spot using Animoto : Direct your students to Flickr . Before they search for photos, ask your students to create a “script” to answer the question – What Can I Do in Rome while waiting for the Pope to be elected – See: Tourist Info . 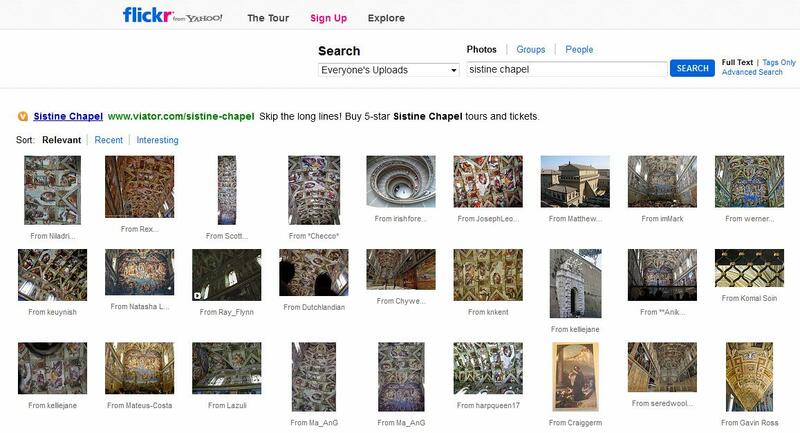 For example a 30 second spot could focus on visiting the Sistine Chapel or the Vatican Museum. Create a virtual poster using Glogster : Once a new pope has been elected, locate 2,3, 4 or 5 websites about the new Pope. 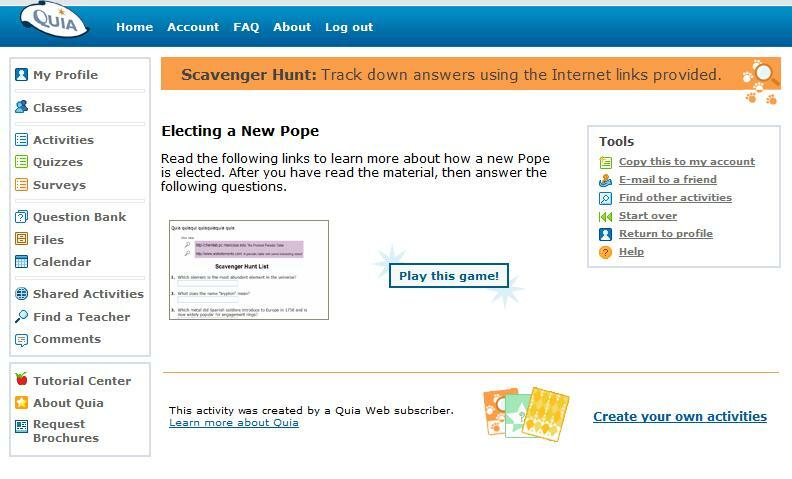 Invite your students to create a virtual poster about their new Pope using these websites to research more about this person. You may want to share a suggested outline for what needs to be included on the poster. For example: A photo of him, a brief biography of his life, and any other point you would like your students to be aware of. Create a PhotoBook about the New Pope using Mixbook : Another way for the students to learn more about our new pope – create a Digital Photo Book about him. Invite them to tell the story of this man from the time he was born until now – including what they are learning about his election. You may want to involve a small group of students to search for the websites that you will refer all students to use for this project. This way you can determine the best websites to use for background research about the new Pope. This may also be a good time to talk about credible, reliable, and non-biased websites. If you like these suggestions, please click the “Like button. We’d also like to hear your ideas for digital projects during this time of electing our new Pope. Share the stories of what your students have created or add your suggestions in the “comment” section of this blog. You rock! People have been asking for Lesson plans – and this is good stuff. Thanks for doing this. Your welcome! I had a feeling that our teachers and catechists would be looking for something in this area. Hi. Your ideas are great. I have out together some resources for schools and you might find them useful too.